This is just a theory, but it’s also absolutely correct and pretty much inarguable: Bernie Sanders ran for president so that he could turn several hours of talking about democratic socialism into a news event. Proof: Bernie Sanders spent a little over an hour Thursday making a speech about Democratic socialism, and here we are, actually talking about it. Sanders’ address to a group of college students at Georgtown University was meant to confront the idea that he’s too kooky to be president, as the New York Times reports, using more Times-y wording than that. Follow-up theory: Bernie Sanders ran for president because of his enthusiasm for FDR’s 1944 State of the Union, and because he was tired of people drifting away at parties when he started talking about it. Oh my goodness is that Cindy I see over there — I really must — I mean— nice talking to you Bernie, bye bye! Against the ferocious opposition of the ruling class of his day, people he called economic royalists, Roosevelt implemented a series of programs that put millions of people back to work, took them out of poverty and restored their faith in government. He redefined the relationship of the federal government to the people of our country. He combatted cynicism, fear and despair. He reinvigorated democracy. He transformed the country. And, by the way, almost everything he proposed was called “socialist.” Social Security, which transformed life for the elderly in this country was “socialist.” The concept of the “minimum wage” was seen as a radical intrusion into the marketplace and was described as “socialist.” Unemployment insurance, abolishing child labor, the 40-hour work week, collective bargaining, strong banking regulations, deposit insurance, and job programs that put millions of people to work were all described, in one way or another, as “socialist.” Yet, these programs have become the fabric of our nation and the foundation of the middle class. Just another follow-up, addendum theory: Bernie Sanders dresses like FDR each and every Halloween. 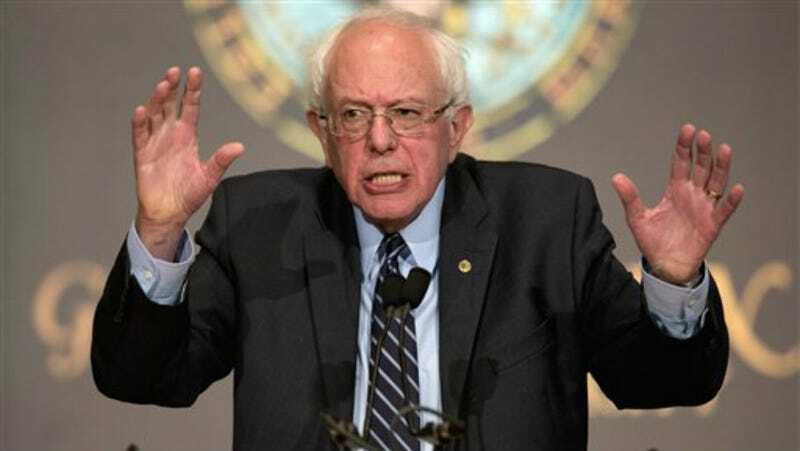 He goes door to door, talking about the 1944 State of the Union, the implementation of the 40-hour work week, and the Works Progress Administration, and he’s just so damn tired of everyone slowly, quietly closing the door while murmuring regretfully Sorry Bernie no more candy here, you take care, OK? Give our love to Jane, uh huh, no, sorry, I hear you saying something about Glass-Steagall through the door but I’m going to pretend I don’t and quietly slide the deadbolt, stay warm out there! Theory, last one: Sanders delivered a full hour and a half about Democratic socialism, solely so that his neighbors will stop complaining about the more-than-lifesize FDR cutout in his front yard — it’s a property value, issue, Bernie, not a personal thing — but also so Rand Paul will stop publicly comparing his ideas to Pol Pot, Chairman Mao, and Joseph Stalin, all while calling socialism “unsexy.” Just kidding, that one’s too wild to be believed.